A patient’s expectations and our own as health professionals can have a profound effect on rehab. Both physios and patients can have unrealistic expectations and become frustrated by slow progress and side-tracked by supposed ‘quick fixes’. This raises a question though, what are realistic expectations following injury? I don’t believe we’ve really established what we should be expecting from various different injuries and so this article is going to attempt to answer this question. It’s a big ask though and I certainly can’t do it alone so we’re going to approach it as a #Clinic_All project (like our very successful TendonQ). We’ll be approaching experts in various pathologies and asking a few simple questions to help us form realistic expectations to guide rehab and adding their answers to the blog series. Rehab usually takes around 3 to 6 months but often requires some ongoing management from the patient to prevent recurrences (which are common). In some cases rehab can extend to a year and beyond. Despite this long timescale we can still see ongoing improvement, albeit slowly. The first stage of the rehab usually involves reducing pain through activity modification and exercise selection. This can take time but we would hope to see some reduction in symptoms within roughly the first 2 to 6 weeks. In clinic, objective signs (like strength) and load tolerance (i.e. the patient can do more without an increase in symptoms) sometimes improve before noticeable improvements in pain. As load tolerance and strength improves we would expect to be able to gradually progress rehab and return to normal activities and sport, however this can take time, flare ups are very common and most patients should expect occasional setbacks on their rehab journey. It’s important to understand why this has happened and have a plan to address it. Repeatedly overloading the tendon can be a barrier for progress. This is often the case when an athlete doesn’t change their training load or continues aggravating activities as part of work or family life. If the patient is unable to modify activity (for example training during the competitive part of a season) we may have to alter our expectations towards keeping symptoms at a manageable level rather than seeing ongoing improvements. Tendon rehab programmes are frequently time consuming and lengthy and it can be very challenging for patients to adhere to them for long enough to see improvement. Use of certain medications and peri-menopausal changes are also thought to affect outcome but more research is needed in these areas. The evidence presented by Kenneth illustrates how challenging it may be to determine prognosis in patients with achilles tendinopathy and that current assumptions about prognostic factors may not be presently supported in the literature. We should recognise this uncertainty in clinic and be mindful when communicating likely prognosis and outcomes with patients. What might have a positive effect on prognosis? Several factors are thought to be linked to better outcomes with achilles tendinopathy but there is little evidence yet to support this. Any other key research evidence to consider? It should be noted that kinesiophobia was not measured from baseline but only at the 5-year follow up so is not a predictor as such although we may assume participants had this kinesiophobia for quite some time. McAuliffe et al. (2017) also highlighted that many face fear and uncertainty over how to manage achilles tendinopathy and this may influence adherence to rehab. Clarifying expectations and providing a clear rehab plan can help allay these fears and guide people back to their valued activities. Closing thoughts: It’s important to recognise that achilles tendinopathy is a challenge to treat and may take some time to improve. Prognosis is often unclear but many do improve with rehab that includes activity modification, progressive loading, graded return to goal activities and education about pain and pathology. Set realistic expectations from the start and remain positive – the majority of patients do well given enough time. 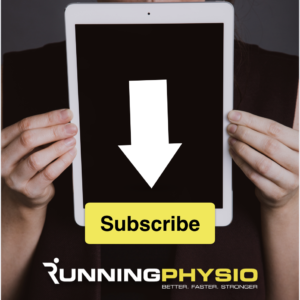 We have the brilliant Jack Hickey, Anthony Teoli and Richard Norris all joining us in this series to share their thoughts on rehab expectations for hamstring injury, osteoarthritis of the knee and ACL reconstruction. For more on achilles tendinopathy sign up below for our free webinar and join our waiting list for Running Repairs Online to be the first to know when it’s available for enrolment. 16. Archambault JM, Wiley JP, Bray RC, Verhoef M, Wiseman DA, Elliott PD. Can sonography predict the outcome in patients with achillodynia? J Clin Ultrasound. 1998; 26: 335-9. 17. de Jonge S, de Vos RJ, Van Schie HT, Verhaar JA, Weir A, Tol JL. One-year follow-up of a randomised controlled trial on added splinting to eccentric exercises in chronic midportion Achilles tendinopathy. Br J Sports Med. 2010; 44: 673-7. 18. de Vos RJ, Weir A, Visser RJ, de Winter T, Tol JL. The additional value of a night splint to eccentric exercises in chronic midportion Achilles tendinopathy: a randomised controlled trial. Br J Sports Med. 2007; 41(7). 19. de Vos RJ, Weir A, Cobben LP, Tol JL. The value of power Doppler ultrasonography in Achilles tendinopathy: a prospective study. Am J Sports Med. 2007; 35: 1696-701. 20. de Vos RJ, Heijboer MP, Weinans H, Verhaar JA, van Schie JT. Tendon structure’s lack of relation to clinical outcome after eccentric exercises in chronic midportion Achilles tendinopathy. Journal of sport rehabilitation. 2012; 21: 34-43. 21. Fahlstrom M, Jonsson P, Lorentzon R, Alfredson H. Chronic Achilles tendon pain treated with eccentric calf-muscle training. Knee Surg Sports Traumatol Arthrosc. 2003; 11: 327-33. 22. Karjalainen PT, Soila K, Aronen HJ, Pihlajamaki HK, Tynninen O, Paavonen T et al. MR imaging of overuse injuries of the Achilles tendon. AJR Am J Roentgenol. 2000; 175: 251-60. 23. Kedia M, Williams M, Jain L, Barron M, Bird N, Blackwell B et al. The effects of conventional physical therapy and eccentric strengthening for insertional achilles tendinopathy. Int J Sports Phys Ther. 2014; 9: 488-97. 28. Norregaard J, Larsen CC, Bieler T, Langberg H. Eccentric exercise in treatment of Achilles tendinopathy. Scand J Med Sci Sports. 2007; 17: 133-8. 30. van der Plas A, de Jonge S, de Vos RJ, van der Heide HJ, Verhaar JA, Weir A et al. A 5-year follow-up study of Alfredson’s heel-drop exercise programme in chronic midportion Achilles tendinopathy. Br J Sports Med. 2012; 46: 214-8. 31. Zanetti M, Metzdorf A, Kundert HP, Zollinger H, Vienne P, Seifert B et al. Achilles tendons: clinical relevance of neovascularization diagnosed with power Doppler US. Radiology. 2003; 227: 556-60. 36. Silbernagel KG, Thomee R, Eriksson BI, Karlsson J. Continued sports activity, using a pain-monitoring model, during rehabilitation in patients with Achilles tendinopathy: a randomized controlled study. Am J Sports Med. 2007;35(6):897-906. 38. De Jonge S, Warnaars JL, De Vos RJ, Weir A, van Schie HT, Bierma-Zeinstra SM, et al. Relationship between neovascularization and clinical severity in Achilles tendinopathy in 556 paired measurements. Scand J Med Sci Sports. 2014;24(5):773-8. 39. Bakkegaard M, Johannsen FE, Højgaard B, Langberg H. Ultrasonography as a prognostic and objective parameter in Achilles tendinopathy: a prospective observational study. Eur J Radiol. 2015: 84: 458-62..
41. de Jonge S, Tol JL, Weir A, Waarsing JH, Verhaar JA, de Vos RJ. The Tendon Structure Returns to Asymptomatic Values in Nonoperatively Treated Achilles Tendinopathy but Is Not Associated With Symptoms: A Prospective Study. Am J Sports Med. 2015: 43 :2950-8. 44. Tsehaie J, Poot DHJ, Oei EHG, Verhaar JAN, de Vos RJ. Value of quantitative MRI parameters in predicting and evaluating clinical outcome in conservatively treated patients with chronic midportion Achilles tendinopathy: A prospective study. J Sci Med Sport. 2017;20(7):633-7.